The 1916 Stanley Cup Final was played between the National Hockey Association (NHA) champion Montreal Canadiens and the Pacific Coast Hockey Association (PCHA) champion Portland Rosebuds This was the first time that a best-of-five Cup championship went the distance. Also, the Rosebuds were the first team based in the United States to play for the Cup. The Canadiens defeated the Rosebuds three games to two in the best-of-five game series. The games of the series were played at Montreal's Montreal Arena as it was the turn of the NHA champions to host the series. This was not the home rink of the Canadiens, but it was larger than their home Jubilee Rink. Games one, three and five were played under NHA rules; Games two and four were played under PCHA rules. Ernie Johnson's share of series revenues was by court order to be paid to the Montreal Wanderers, who he had left while under contract to go to the PCHA. For the entire series, future Hockey Hall of Fame goaltender Georges Vézina aided Montreal by posting a 2.60 goals-against average. Didier Pitre led the Canadiens in scoring with 4 goals. The 1915–16 Montreal Canadiens season was the team's seventh season and seventh of the National Hockey Association (NHA). After finishing last in 1914–15, the club rebounded to win the league championship and win the Stanley Cup for the first time. he Canadiens revised their lineup after finishing last. Ernie Dubeau, Jimmy Gardner and Harry Scott retired. The Canadiens added Howard McNamara and Goldie Prodgers on defence. Jack Laviolette moved to forward from defence. Lalonde would have an outstanding season, leading the league in scoring with 31 goals and Georges Vezina would improve his GAA to 3.2, second in the league to Clint Benedict. The team would win all of its last seven games (and eleven of the last twelve) of the season to take the league championship. 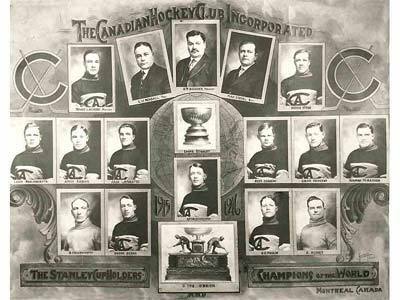 n 1916, the Montreal Canadiens of the National Hockey Association won their first of 24 Stanley Cups. The Canadiens, winners of the NHA, faced the Rosebuds from Portland in a best of five competition. For the first time, a best of five Stanley Cup championship went the distance. After the Rosebuds won game one, 2-0, Montreal captured games two and three to gain the advantage. Portland came back to even the series in game four to set up the deciding fifth game. In the final match, the Canadiens bounced back from an early 1-0 deficit to score two unanswered goals, with seldom-used Goldie Prodgers netting the Cup winner. The 1916 Stanley Cup Final features the National Hockey Association champions facing the winners of the Pacific Coast Hockey Association. After posting a regular season mark of 16-7-1, the Canadiens – led by Lalonde, a 31-goal scorer during the 24-game NHA schedule, and Pitre – match up in the final against the Portland Rosebuds, the first American team with an opportunity to win the Cup. Portland’s lineup includes PCHA scoring leader, Cyclone Taylor. Montreal enjoys home-ice advantage throughout the series with all five games played at the Westmount Arena. With the two leagues competing under different rules, Games 1, 3 and 5 are played under NHA rules, and Games 2 and 4 are contested under those of the PCHA. In the first game, the Canadiens are shut out by the score of 2-0, the result of a brilliant performance by veteran goalie Tommy Murray and the Rosebuds’ defense, led by Ernie Johnson and Del Irvine. The home team is far from done, as the Canadiens bounce back in the next two games with 2-1 and 6-3 wins. After the Rosebuds even the series with a 6-5 victory in the fourth game, the Canadiens raise the Stanley Cup for the first time in team history with a win in the fifth and deciding game. The team overcomes a 1-0 deficit to claim a 2-1 victory thanks to a goal by role player Prodger midway through the third period. Pitre drives the Canadiens’ offense with four goals in five games. Georges Vezina leads the way between the pipes, maintaining a 2.60 goals-against average.